Muskie Time - Are You Ready? 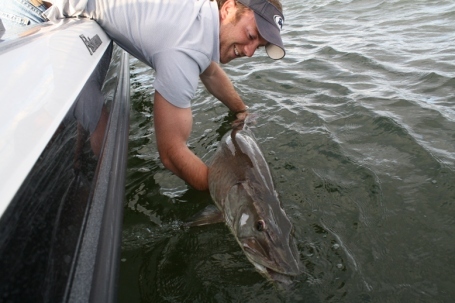 The author Travis Frank releases a 51 inch muskie caught during the early season. The time has come! The anticipation has been mounting and I am giddy with excitement. Tis a day for celebration in musky country. The first follow of the year, the first strike, and hopefully the first slime in the net. Does it get any better than this? Like the rest of you muskie crazed lunatics, I am ready to chuck the big gear. Here are a few things on my mind as we head into the 2010 season. First and foremost, I think about the fish. Do I have everything ready for a proper release? I use a huge net that allows me to keep the fish resting in the water. I never take them out of the water or lay them in the boat. A long handled pliers helps to unhook them from the water, and a hook cutter is ready in case it is necessary. I can't stress enough how important your release practice becomes when you start handling several muskies. Remember, we are in control of this precious resource. The camera is ready and a couple of quick clicks ensures the fish is back in the water within 15 to 20 seconds - max! If you aren't willing to have a plan in place, I strongly encourage you to think again before you head out. It's that important! Next, do I have all my gear ready? I will admit that I have some hook sharpening to do, and I strongly encourage you to do the same. More fish are lost each season by people fishing with dull hooks. It's to your advantage to sit down and make 'em razor sharp. If not, you will be one of those guys talking to your buddies about the one that got away. It's the difference maker. If your leader has a kink in it - throw it out. If your line is weathered and old - throw it out. You are already spending a ton of money on everthing else. The connection between you and the fish is the most important aspect in all aspects of the battle. You'll be thankful when that fish is in the net, or heartbroken when your broken down equpment fails. Like most of you, I have some new equipment to check out. I'm opting for a few different rods this year and I'm excited to see what a 9 footer can do instead of the short and stubby 8 footers. Man has this sport evolved. I can remember using a 6 foot stick and thinking it was the "cats meow." When will we stop and where? I hope we continue to raise the bar each year. Every year I ponder where I will start and what goals I have for myself. This year is no different and leads to great anticipation for what is ahead. The beauty of it all is that we simply do not know and will not know until we hit the water. For opening day, a good rule of thumb would be to try anything and everything. If you live in memories of last year or the previous seasons, then you may be living in a dream that won't reproduce. I like to think outside the box and continue to change it up EVERY DAY! This keeps me ahead of the game so to speak and allows me to find fish that I might have otherwise overlooked. I fish new waters on opening day of the season, and the last day of the season. Even with several hundred days on the water each year, my goal is to learn something new every time out. If I follow this rule of thumb, I believe the numbers of fish in the boat will speak for itself and I will be able to walk away with a successful year on the water. To dispose an early season muskie myth, I will probably start the season with Pounders or another oversized muskie bait. Think about it this way. All of the muskie food in the water is at least 1 year old. They are use to eating fish from the year before, and this year's spawn isn't even close to being ready for dinner. My experience has shown a binge period for the muskies after their spawn is complete. This will likely hold true this season, and I encourage you to think outside the box - go big or go home! I also have a few rules that I live by on every muskie water and they may help you on your monster quest. First, you have to be where the muskies are if you want to catch them. Find their food source, and you'll find them. This could be in 3 feet water or 30. As my good friend Bob Turgeon likes to say "They are the top of the food chain, they don't lead the way, they have to follow." Next, remember that all muskie lures resemble food to a fish. Become good at using a few baits and worry less about throwing everything in the box. It's called a confidence bait. They will only eat when they are ready, and if you have your suff together, you WILL make it happen when the time is right. It's on their schedule, not yours. Lastly, focus on the key feeding windows and make sure you are casting over fishy waters when they are ready to eat. Our pressured fish will only eat for short windows of time, and it is imperative to be fishing them when they turn it on. It's possible to catch 3 muskies in three casts if you play your cards right. The figure 8 should be your biggest asset on the water. When done correctly you can up your catch by over 50%. Do it every time. Do it with enthusiasm and do it when you are sick of it. Swing your rod tip deep in the water and change the vertical and horizontal angles. Remembe that a 4 foot fish cannot change its direction in the water immediately. Lead them and force them to chase down your offering. It's exciting and it works. Do it with passion and you'll get your muskie on the figure 8. Finally, I head into the 2010 season with hopes of our sport growing yet again. I'm proud to call myself a muskie fisherman, and I'm proud to be associated with each one of you. I don't think there is another group so passionate about the fish they pursue and so proud of every catch. We really take it to another level. If it weren't for the dedication and love of "OUR" fish, we wouldn't have the resources at our hands today. Share it, enjoy it and take care of it. The sport is in my hands and yours. To all of you that hit the water for the Minnesota Muskie opener this weekend. Good luck! And, in the words of our resting muskie godfather, Jack Burns, "Catch a big one, and let it go." Until next time, keep on livin' the dream! Travis Frank’s motto is "Livin’ the dream." That means he’s on the water or in the field 300 days a year. He’s been a fishing guide at Trophy Encounters for the past 10 seasons chasing Minnesota’s toughest fish, the muskie. When he’s not on the water, he's in the deer stand or chasing Midwest fowl. Making memories, one bitter cold walleye at a time. A few reasons to be optimistic heading into opening day - especially if you plan to fish in the metro. Muskie season is here! Are you ready for battle? A 'New' Muskie Lure for 2011? Looking for an advantage going into the muskie season? You may want to give this bait a try.